New Year, New (Skinny) Pet! 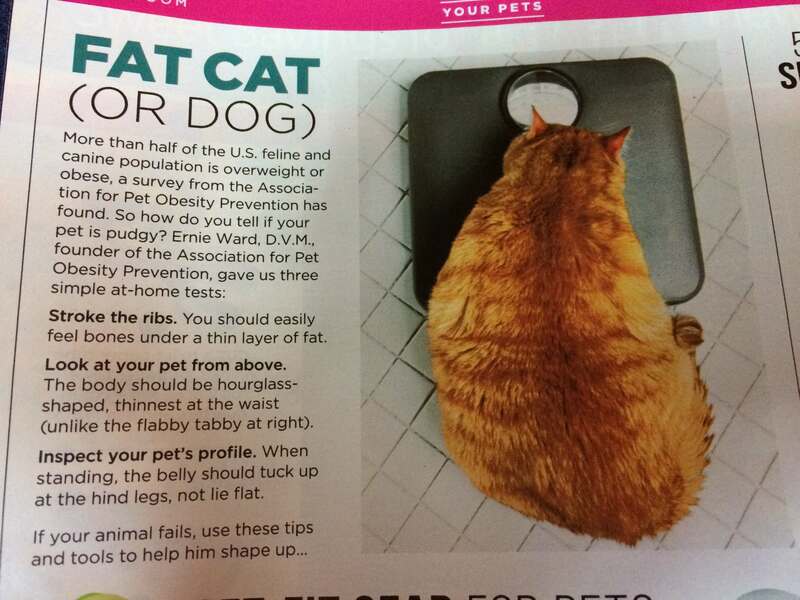 I was so excited to see a blurb in a recent issue of Good Housekeeping magazine, discussing one of my great veterinary crusades: pet obesity. 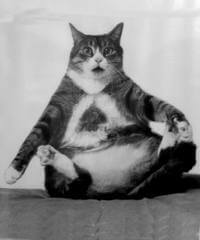 The cat in this photo is obese, but my guess is that many clients would think he’s only “chubby” or “plump”. Let’s call a fat cat a fat cat! Obesity is a disease, just like diabetes or kidney failure. It is not a cosmetic problem, but a serious medical problem. There is some good advice in this snippet. How do you know if Fluffy or Fido is overweight or obese? And what can be done about it? Veterinarians use a body condition score (or BCS) to help rate our patients’ nutritional status when we examine them. The scale is from 1-9 with 1/9 being emaciated and 9/9 being morbidly obese. I see way more 9’s than I’d prefer! For pet owners, there are three simple ways to help determine if your pet is overweight. 2.) If you look at your dog from the top, he should have a waist. 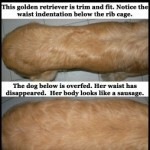 Meaning, Fido should “tuck in” and be more narrow behind the ribcage. 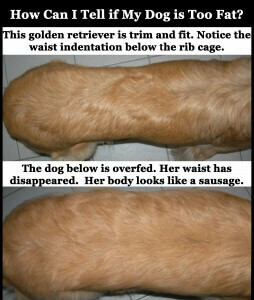 If your dog’s middle section is as thick as his chest, he is overweight! The same is true for cats. How can you help your pet lose weight? Good Housekeeping details some great ideas, which I will expand upon. 1.) Move the food bowl daily so your pet has to get up and find it. This is probably better advice for cats than for dogs. Also recommended by many veterinary behaviorists are “food puzzles“, which require the animal to really work and actively “hunt” their food before consuming it. 2.) Reward by petting and praising, not with treats. For this one, I would say to dramatically reduce the number of treats and substitute lower calorie options for calorie-rich treats such as peanut butter and rawhides. For dogs, carrots, green beans and Cheerios are low-cal treat choices. For cats, consider bonito flakes or catnip. In truth, play and affection are better ways to engage with your pet (and will help him lose weight). However, treats are an important part of the pet-owner bond, so I don’t recommend discontinuing them altogether. 3.) Don’t leave a full self-feeder out all day. 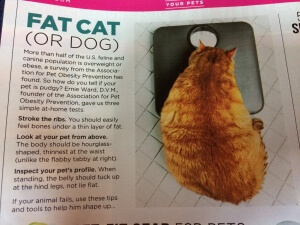 To me, this is the single best thing owners can do to ensure their pet has a healthy waistline. Most cat owners feed “ad lib”, meaning there is free access to an unlimited quantity of food throughout the day. Some dog owners do this as well, but it’s more of a feline problem than a canine one. The simple reality is that virtually every animal will overeat if they have free access to food. We have domesticated our cats and dogs in most every way, but we have not domesticated their appetites. Just as I don’t have self-control when there is a pint of chocolate peanut butter ice cream in my freezer, Fido and Fluffy cannot be expected to have self control when highly palatable, energy-dense food is available all the time. 4.) Exercise him half an hour a day. Break it into 10 minute chunks. Maintaining a healthy body weight is really a simple input/output equation (assuming there are no underlying medical diagnoses causing weight gain.) 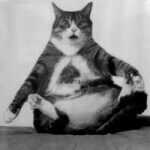 If your pet is overweight, he is consuming more calories than he is burning in the course of a day. Decrease portion size and increase calories burned via exercise; in other words, increase output in the face of reduced input! For cats, have them chase a laser pointer, feather or follow a toy on a string. My cat will run up and down stairs to catch “mice” that I throw for him; other cats will fetch crinkle balls or even balls of tin foil. For dogs, walking is an easy way to burn calories. If your Fido will fetch, several fetching sessions a day will dramatically increase output. 5.) Scoop food precisely using a measuring cup. Precise is the operative word here! So often when I ask clients how much they are feeding Fido, I get either a blank stare or a hand gesture indicating a vaguely large quantity. Some clients will say “I think it’s about a cup”; when I ask if that’s measured with a measuring cup, the answer is often no. Your cup and my cup may be two vastly different portion sizes! There is no one-size-fits-all equation to know exactly how much to feed your pet. It varies greatly depending upon breed, life stage, health history and activity level. To determine the appropriate amount to feed your pet, please consult with your veterinarian. They may even give you a free measuring cup to kick start your pet’s weight loss plan!